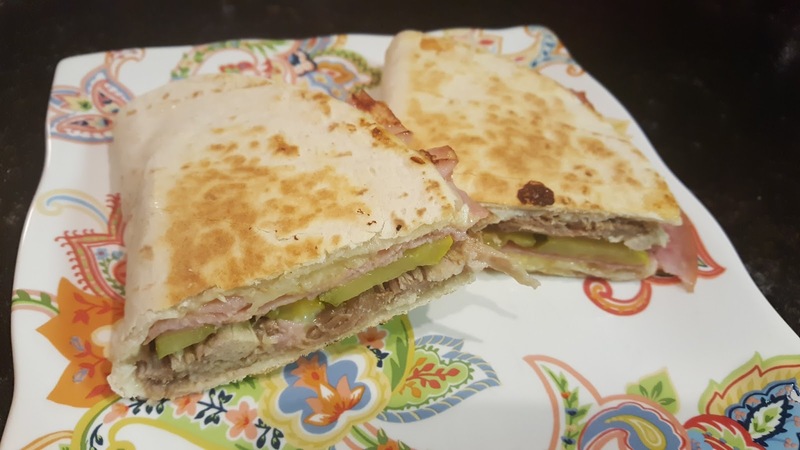 I love everything about a Cuban sandwich, and I order them whenever I get a chance at a restaurant. So when I saw this recipe for Cuban Quesadillas, I knew I had to try them. I thought I would like them, but I didn't realize I would L.O.V.E. them. Seriously, folks. I made the quesadillas FOUR TIMES in 10 days. That's 2/5. And nobody complained - in fact, every time, there were comments about how delicious these were, how they were the best quesadillas ever, etc., etc. This has everything that is great about a Cuban sandwich and puts it between tortillas - so there's even more meat and cheesy goodness. And don't forget the pickles - they are what "makes" the sandwich. The amounts below are really just guidelines - if you don't want to use pulled pork, you could sub sliced pork tenderloin or use leftover roast pork, whatever. Use as much ham as you want - I think I used up to 4 slices because it was really thinly sliced. Just pile on that meat and cheese goodness, top with pickles and honey mustard (regular mustard is standard, but I really like the zing that the honey mustard gives these quesadillas!) and griddle 'em up. That's all there is to it. Find more great stuff at Inspiration Monday, Busy Monday, Inspire Me, Inspire Me2, Fabulous, Show and Share, Hearth and Soul, Wow Me, Wow Us, Whisk It, Full Plate, Wonderful Wednesday, Favorite Things. Heat a grill pan, sandwich press or large skillet. Place 4 tortillas on a flat surface, top each tortilla with 1/4 cup swiss cheese. 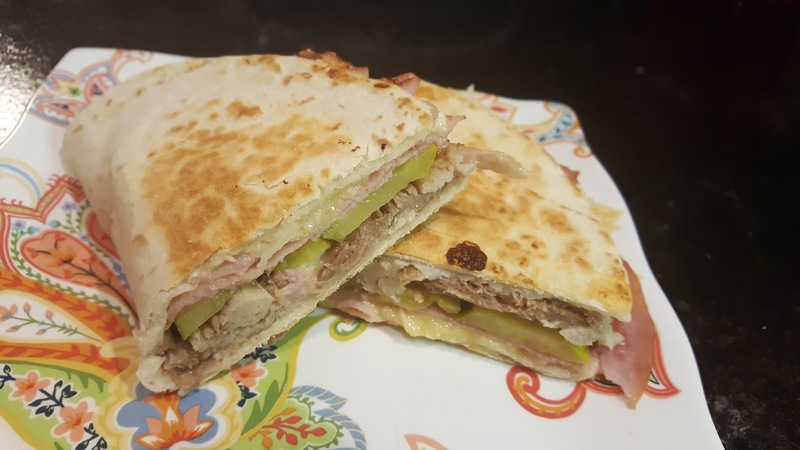 Divide the pork, pickles and ham evenly between the 4 tortillas, squeeze the mustard on top of the ham. Sprinkle 1/4 cup of mozzarella on each tortilla, then place the 4 remaining tortillas on top. Cook each quesadilla for 3-5 minutes on each side or until golden brown and cheese has melted. Serves 4. Your Cuban Quesadillas look awesome, we will really enjoy them! Thanks so much for sharing your post with us at Full Plate Thursday. Have a great week and come back soon!